Following several years of R&D, Hook Marine is planning the commercial launch of its SeaWise Stability Monitor solution – and, if all goes to plan, the product should be on the market in late 2018 or early 2019, Kenneth Smith, Hook Marine director, tells Ship & Boat International. 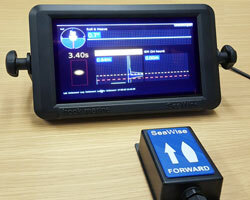 Primarily developed as a safety tool for coastal and deep-sea fishing boats, the SeaWise monitor could also be adopted by any small-to-medium-sized boat operators looking to safeguard their assets from the problem of declining stability. The fishing boat segment has proven of particular interest to Hook Marine, though, given the high number of stability-related incidents affecting these vessel types. The SeaWise software has therefore been developed to continuously measure roll period over the course of operations, so as to give the crew advance warning of any potential risks to vessel stability during the journey. However, Smith explains, in addition to collecting roll-related updates, it was important that the monitor was able to exclude unwanted, extraneous data. Hook Marine has put the SeaWise through a number of lab and field tests: for instance, the solution’s sensors were investigated in a wave basin at the University of Edinburgh, Scotland, while initial field tests were as simple as “monitoring a harbour boat in still water, with half a dozen guys rocking the boat and the letting it go, to establish the boat’s GM,” Smith says. These vessel trials were then extended offshore, and conducted aboard a number of different trawlers, seine netters and creel boats. In terms of onboard set-up, the SeaWise looks pretty straightforward to connect and run. It comprises a main display unit, about the size of a conventional tablet, which connects to a smaller box, marked with a boat and arrow. The user positions the box with the arrow pointing forwards, to detect the rolling motions. “You can run the SeaWise system off a typical 12V DC or 240 AC power supply, and installation takes about 10 minutes,” Smith adds.